For a man who was once described by Andrea Pirlo as “the first nuclear-powered South Korean”, South Korea’s Park Ji-Sung has made quite the name for himself for his endless energy. 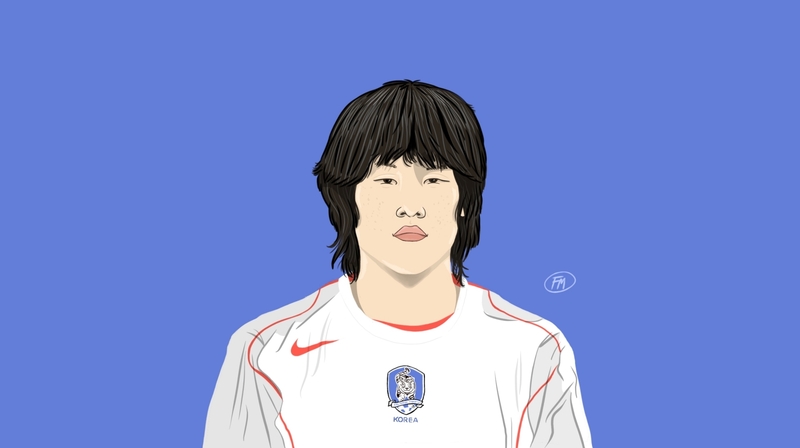 The most recognisable South Korean footballer of all time, his career that went from Suwon, where he was raised to the greatest successes in Manchester, make him the most accomplished South Korean ever. Park’s journey started off with local club Kyoto Purple Sagna, where he proved to be a key figure behind their promotion campaign in 2001, and later in the J1 League – the top Japanese tier in 2002. It was this season that shaped his career as it earned him a spot on the South Korean national side that was to host and compete in the World Cup finals of that year. It was at the World Cup that his stock would rise. Usually the first name on the team sheet, his performance against Portugal in their toughest group game, where he scored a historic goal to help them qualify, has his name etched in Asian football folklore. He controlled the ball with his chest, beat a defender and eventually volleyed it into the net, making it look much easier than it was. He later put on tireless showings against Italy and Spain in the knockout rounds to help South Korea make it to the semi-finals – becoming the first Asian nation to do so. That showing earned him a move to PSV Eindhoven, where former national team boss Guus Hiddink was keen to have him. In the Netherlands, he became a cult figure with the club, often having several chants ringing to his name. Despite initially struggling with his new surroundings and having his spell serenaded by injury, he took a year to settle, either centrally or on the right side of midfield. His passing range and willingness to put an effort in defence was often lauded as he won two league titles, the KNVB Cup and made it to a Champions League semi-final, before departing for Manchester United. Under Sir Alex Ferguson, he was the Scottish manager’s utility man, often proving his worth on the biggest stages. His knee problems from his time in Netherlands were often an issue, but he was resilient enough to rack up over 200 appearances and 27 goals for the club in a seven-year stint, and in the process becoming the first Asian to win Premier League and UEFA Champions League honours. He earned the nickname “three-lungs Park” and was always a loved figure at the club. Ferguson’s faith in him showed when he started him in the Champions League final of 2009 against Barcelona, and he was a trusted figure in big Premier League games – he scored a third of his 27 goals for the club against Arsenal (five), Chelsea and Liverpool (two each). While his image continued to grow in England, he maintained an equally positive status at home, where he was central to his country’s chances at the 2006 and 2010 World Cups in Germany and South Africa. The roster for these two editions weren’t as talented as the one in 2002, nevertheless he scored in both tournaments, becoming the first Asian player to score in three consecutive World Cups as they only made it past the group stages in 2010, losing to Uruguay in the last 16. Park left United in 2012 to join Queens Park Rangers as he approached the twilight of his career, but was unable to replicate his impact, and went back to PSV after QPR were relegated. He scored twice in his second stint in Holland, before retiring with injury problems aplenty.